Oh, no! Debbie's getting splashed!I love Deborah Freedman's picture books, SCRIBBLE, BLUE CHICKEN, and THE STORY OF FISH AND SNAIL (which just came out a couple of weeks ago and is already one of Amazon's best books for 2013). In a way, it's no wonder she's so good. She's been working at this for more than twenty years. That's the kind of time and dedication it takes for so many of us. Debbie was kind enough to talk with me about how the SCBWI has supported her career, and in particular, how going to a national conference can make a big difference. If you're still on the fence about SCBWI-LA in August, read Debbie's story. And then sign up! There's still time! 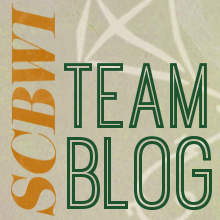 When did you join the SCBWI? In 2000 I discovered SCBWI through a friend, after confessing that I’d secretly been writing children’s books for over ten years. It turned out that she had been doing the same thing! What was the first clue you had that it would make a difference for your career? As soon as I joined and received my membership packet, I realized that the Market Survey alone was worth the cost of joining. And then I went to my first conference and began to meet other writers and illustrators — priceless. Is there any one moment that stands out as one that transformed everything? Yes! After several years of sending art samples around, I’d connected with a few editors but nothing concrete was happening, so in 2005 I finally attended the New York conference and put a small, pen-and-ink piece on display at the illustration exhibit held that year. They gave out what seemed like a bajillion illustration awards, and I didn’t get a single one. But an editor picked up one of my cards and contacted me, asking if I had anything else to share. Of course I did, after all those years of writing; I had a pile of illustrated manuscripts, each one screaming me! Pick ME! Poor dummies. 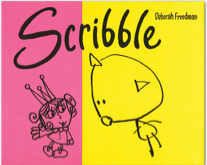 They are all still locked in a file cabinet except for one —the dummy for a book called Scribble. A few weeks after I sent those teeny-tiny bound sketches to Erin Clarke at Knopf, she called, and in 2007 I became a “debut author-illustrator”. Now that you are so well published, how does the SCBWI continue to support your career? Well, as many authors will sadly agree, publishing one or two books doesn’t necessarily mean that you will publish another. For most of us, there are ups and downs. Making professional connections through SCBWI has helped me keep this thing going — now to the point where I hope I can call children’s books a career. We can call it networking, but that sounds so dry! I have met editors and agents who have been encouraging and generous, and I’ve made true friends. My local chapter (in Connecticut, run by Kay Kudlinski), especially, is supportive, inspiring, and dear to me. I love meeting other children’s writers and illustrators — and we never stop needing each other. What do you wish every aspiring author/illustrator knew about this business? It’s certainly important for us to thoroughly educate ourselves about this business — but the work must always come first. After all, where in the publishing world will we go, if we haven’t yet pushed ourselves creatively as hard as we can? So, patience, my loves. Slow down, make enough space, and mute the chatter — until you can hear your own voice.